My name is Nic Robertson and during my Gap Year I participated in a three-month long expedition to Svalbard in the Arctic Circle. The expedition was organised by BSES, a registered charity, and involved 20 young people together with 6 leaders, a chief leader, a basecamp manager and a doctor. Although my time in Svalbard passed quickly, three months is a long time to write about so this report will only be able to outline what we did. I will try to pick out a few important moments to expand on and also write about what kit we used and what I have gained from the trip. Svalbard is a archipelago located just 600 miles south of the North Pole which is 60% covered by glaciation and home to around 3000 polar bears. Although owned by Norway, the islands have been demilitarised since 1920. 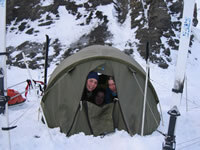 BSES described the expedition as “an opportunity for adventurous young people to explore and experience a remote and challenging environment, under the guidance of experienced leaders, learning how to live in tents, travel safely, and work effectively together.” They also billed it “Extreme Arctic” as well as sounding impressive, reminding people they had signed up for something “extreme” was an excellent way of dissuading overt hesitation on tricky ridges. It was an excitably nervous group of people who took off from Heathrow Airport at around lunchtime on the 13th of March 2006. We were also an odd-looking bunch; to help get round weight allowances we deployed cunning tricks like wearing our helmets and wearing laced-together mountaineering boots as fashionable necklaces. After a night stop-over in Oslo we landed in Longyearbyen the main settlement on Svalbard to meet the advance party consisting of Ade Harris, our indominatable Chief Leader, Jackie Spong, our basecamp manager, and Leo Nathan, one of our leaders. The original plan for the expedition had been dramatically altered as, for the first time on record, the sea ice we were due to cross had not formed in the fjord to the North of Longyearbyen (Adventfjorden). As we were prevented from reaching our planned operating area of Bunsow Land, the Chief Leader rearranged our food dumps around a smaller area around Adventdalen (In Spring when we arrived – Adventdalen is frequented by large groups of tourists on skidoo tours. I nicknamed it “The M1 of the Arctic” but the name did not catch on!). Although it created problems for the science program which had been designed with specific glaciers in mind, I believe this change of plan was beneficial to the expedition. Firstly, the constant rejiggling of plans and resources gave us an excellent insight in to the complex logistics behind a large expedition logistics which could be easily taken for granted. Secondly, operating in a smaller area meant we were compelled to thoroughly explore the areas we were in. This is a delicate way of saying that we did less long-distance pulling of our pulks (or sledges and we did pull them a lot!) and more time climbing mountains and learning skills. The huge amount of contact time with experienced and qualified instructors was one of the great benefits of the expedition. Once under way, the expedition was divided in to 3 “fires”, each of 6 young people and 2 leaders. The Chief Leader and Basecamp Manager stayed in “basecamp” essentially a food dump while the fires went out and explored. Contact was maintained through each fire and basecamp having (for this read “carting around heavy”) HF radios. The small size of the fires meant activities and plans could be discussed and decided upon easily. Roughly each month, all the fires returned to basecamp in order to move basecamp and rearrange the fires; in this way most people on the expedition had spent time in a fire with the majority of the expedition. In truth, expeditions are far more interesting to those who took part than to outsiders – the whole experience is so different from normal life that it would be pointless to try to fully describe it. 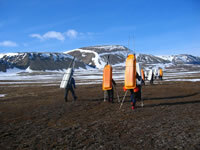 For example, a quiet evening stroll in Svalbard entails carrying a rifle! I will concentrate on the things about which I have been asked most frequently as a way of selecting from a massive range of possible things to write about. Often in the question is the suggestion the answer might be the cold, the discomfort of living in a tent or social tension from living in such a confined place. For me the true answer would be the day that we moved from Basecamp 2 to Basecamp 3 the snow had melted prematurely so we were forced to carry all our kit, together with our sledges and skis, on our backs. It was heavy! But the nice thing about expedition is that you are in everything together with your mates. and everybody has to adapt and cope with the same situation. Everybody may find different aspects challenging but everybody recognises this and is supportive of each other. I found this created a spirit of cheerful camaraderie far beyond any superficial notion of teamwork. As for the discomfort, the answer was experience. 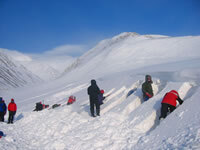 It is easy for living in tents and eating dehydrated food to be unpleasant, but the challenge is to learn routines and countless “top tips” to make everyday tasks in the Arctic quick, efficient and comfortable. I learnt a massive amount, from how long different meals took to rehydrate to how to how to cut down the weight of a wash-bag. Im sure there is still a lot more for me to learn. Generally the hardest part of the expedition was the first few days. It was cold (around 15oC) and poor weather, and the learning curve was steep. My diary entry for the first morning in the field reads “Bit depressing getting up – v. cold, ice in tent” (the ice is caused by condensation). In fact the weather deteriorated further over the next couple of days, to the extent that nearby professional guides were being extracted by helicopter. Partly as result of the weather and partly due to our inexperience, a large number (including me) got mild frostbite, and sadly one expedition member got bad frostbite in one foot and had to be skidooed out. Although morale was still excellent (it is possible to laugh about your fingers being too sore to open your dinner!) it was decided to return to Longyearbyen for a few days of recovery and briefings before heading back in to the field. Most of the leaders were first and foremost keen mountaineers, and their enthusiasm was infectious. It wasnt just bagging the relatively small but often “gnarly” peaks, but also constructing Tyrolean Traverses and emergency shelters, practicing abseils and doing a little ice and rock climbing. We also dabbled in the noble sport of “pulkeneering”. My introduction to this came in my first fire, dubbed Rein I – Rein is the Norwegian for Reindeer. Svalbard has a unique species of Reindeer which can often be found standing still to conserve energy. They mostly survive on eating scrub grass which is accessible during the summer months, and they die when their teeth wear out from scraping on the hard ground. We were due to take over from another fire doing a glacial survey. Rather than exit our valley, go along the main valley (Adventdalen) and back up into their valley, we decided it would be entertaining to take the direct route (with our pulks) over a col. This turned out to be very steep and only slightly lower than the surrounding hills (the maps of Svalbard only show 50m contour lines). It was after much sledge hauling, pulley construction and stomper-belay lowering that we finally arrived at 2am, having had a prompt 9am start. I also especially enjoyed the first phase after 24 hour light took over, around the middle of the second month. Because the sun is still lower in the sky at night until high-summer, the snow is crisper and rock-fall less likely. 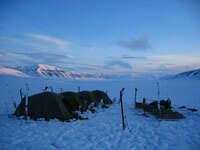 We therefore switched day and night around for a trip to the BSES hut at Tempelfjorden. The light from the “almost sunsets” was magical. In truth nobody has asked me this, but we talked about kit a lot during the trip. Having your comfort and survival depend on it makes outdoor kit a lot more interesting! 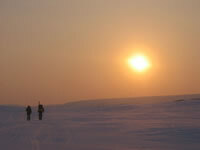 At the start of the expedition the temperature was around 15oC and by the end it was mostly around +6. The equipment you would take on a trip where you were expecting average temperatures of 0o would be much different from that if you were expecting 21o, and so the most useful kit changed throughout the trip. When it was cold, my pile lined Pertex (“Buffalo-style”) top and salopettes were invaluable and very practical, and more than warm enough whilst moving. When it became too warm to wear these while active, most of us switched to a more conventional approach of wearing thermals underneath waterproofs, then putting on a down jacket as soon as we stopped. After a few weeks of the cold and eating high-energy food the bodys metabolism increases to produce more heat. The upshot of this is that, while moving, we were comfortable wearing just thermals in temperatures that would be considered very chilly in the UK. Overall I was very happy with my gear although I wish somebody would make gloves that dont fall to bits once you have run a few ropes lengths through them while lowering pulks. I think it is too easy to describe an experience as “life changing” expeditions are certainly life changing for the duration, but the real test is whether it imparts anything that remains valuable on return to the relatively mundanity of everyday life. I believe I have acquired some valuable viewpoints and attitudes, for an example an attitude of solving problems efficiently without letting them become an overwhelming issue (essential when your stove breaks just as you want your tea). The experience of learning to live in a new environment emphasised to me the need to constantly try to examine how you do things to see if it can be improved. More generally I think the expedition served as an unrivalled introduction to mountaineering and has given me a lot of enthusiasm to develop my skills and experience. 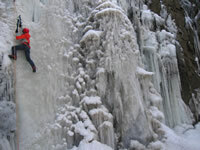 This summer a small group of us from the expedition are heading to the Alps to try to do just this. The sea-ice situation and glacial surveys made global warming seem like a current crisis rather than a hypothetical risk. The Arctic environment can often be harsh but it is also extremely fragile. I hope it is not too late for us to protect it. Finally I found being away from everyday life gave me a chance to think about life at home in a new way during quiet moments. I will never forget the endless, staggering silence on the ice-cap. Was it strange having your first shower after three months? I dont remember it being so. I suppose I was very tired and in a bit of daze, but I also suspect it would take more than three months after eighteen years to make modern amenities seem like a novelty. I would like to thank all my family and friends who supported me preparing for my expedition. I would also like to thank everyone the General Practice Section of the University of Edinburgh for being so supportive while I was employed there and preparing for my trip.